Sustainability - addressing climate change, depletion of natural resources, waste, pollution, increasing population etc. and how individuals, organizations and governments can develop sustainable strategies and practices. Knowledge management - creating, managing and enhancing our knowledge to develop more competitive and sustainable economies, businesses and lifestyles. Developing these new websites is a long-term 'retirement' project. The first phase of the updated KM website went live in 2011. Content that has not been updated is at the KM archive website. The panel on the right takes you into relevant sections of both websites. I look forward to providing you with quality content on these two important topics over the coming years. 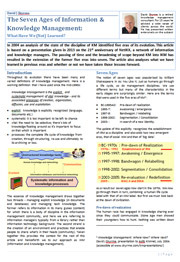 New to knowledge management or just brushing up your KM knowledge? An article that assesses the contribution of information technology in KM programmes. One of several new articles published for the first time on this website. Getting stuck into a knowledge management? Then this route map will help you succeed in your journey. It covers the four main dimensions of KM - strategy/process, information/knowledge, human/organizational and technology - and takes you through various stages from the drivers, assessment, development, deployment and evaluation. This section also covers ten key themes and personal, team and policy toolkits.